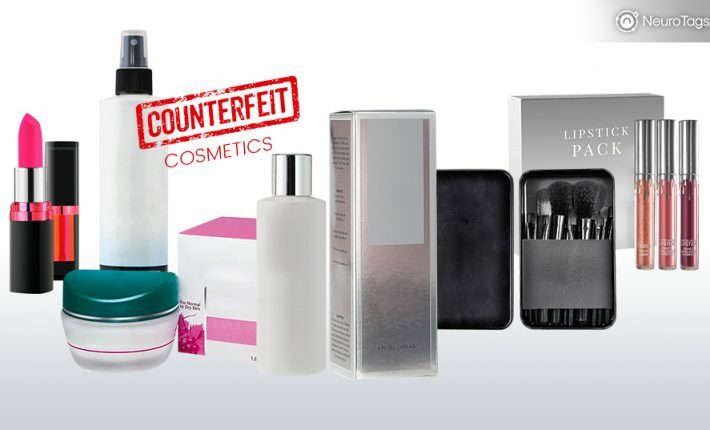 Counterfeit cosmetics contain dangerous ingredients and are manufactured in unhygienic conditions. Using such products may have unimaginable side-effects and health risks. The cosmetics industry is called a recession-proof industry and has been growing at a steady rate every year. Counterfeiting in makeup brands too has been growing parallelly at an alarming rate. As per FICCI CASCADE, 30% of FMCG items in India were found to be fake. The more shocking finding is that 80% of the customers bought these counterfeit products thinking that they are purchasing genuine ones. FMCG refers to the products such as soap, detergents, cosmetics, and other toiletries, etc. Lots of people unknowingly use fake cosmetics which may potentially contain high amounts of dangerous chemicals and bacterias. Many of these chemicals are carcinogens (cancer-causing substances). Counterfeit makeup products have been found to contain hazardous chemicals like arsenic, mercury, nickel, lead, cobalt, chromium, copper, and aluminum. One fake lipstick of a brand was found to have 15 times more lead than the original product in a lab test. And in another test, a fake eye makeup had 2000PPM of copper, whereas safe limit is 100PPM. Genuine eye makeup was found to be completely safe. Animal waste was also present in many phony makeup products. Counterfeiters imitate the real products so well that it is very difficult to differentiate between real and fake ones. If they copy lipsticks, they copy packaging and the shade such a way that the buyers don’t suspect the authenticity of the product until they experience unwanted side-effects. The side-effects include skin allergies, rashes, eye infection, swelling in the affected area and so on. Makeup brands lose revenue, customer trust, and reputation because of their counterfeit products. Makeup brands can protect their customers by deploying a foolproof Anti-Counterfeit solution. The solution should be so robust that the counterfeiters can not fool the buyers anymore. NeuroTags provides a very simple, economical and easy to deploy Anti-Counterfeit solution. 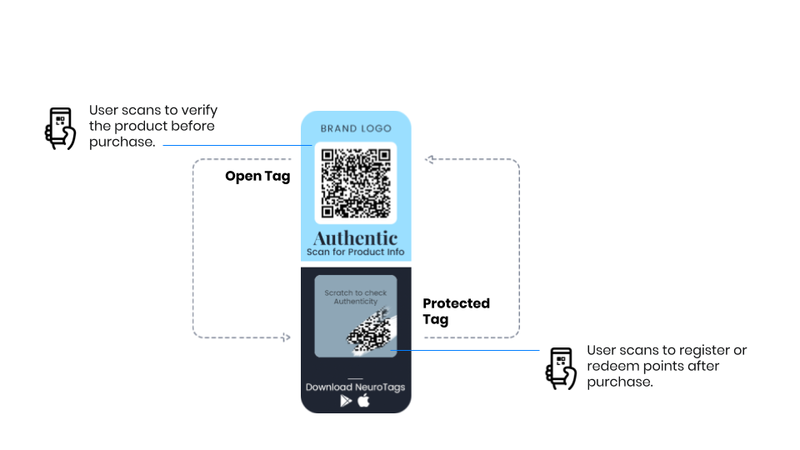 To protect the cosmetic brand against the counterfeiting, NeuroTags offers algorithmically coupled crypto tags to be applied to the products. Each crypto tag consists of two parts – open tag and protected tag. Open and protected tag are algorithmically coupled and are backed by patent-pending technology & AI. These tags can be scanned using any smartphone. The open part of the crypto tag can be scanned by the prospective buyer to check the product authenticity with a fair amount of certainty. The protected part of the tag is either hidden by the scratchable layer or kept inside the sealed packaging. The buyer has access to this part only after buying the product and can check the product genuineness with 100% certainty by scanning this tag. The tag scans are monitored and protected by algorithms and AI on NeuroTags server in such a way that, if a counterfeiter tries to replicate the tags, anomaly detection algorithm catches it and the products with copied tags get invalidated. In case a tag scan is detected to be counterfeit, the user is directed to a screen where information about helpline numbers and ways to report the counterfeit can be found. NeuroTags solution also includes assistance in integrating the tagging solution on the current packaging line. More information about the solution can be found here.